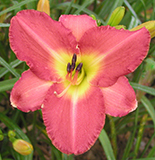 The daylilies with fragrant flowers that are listed below are in good supply. 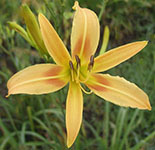 We have smaller numbers of many other fragrant flowered daylilies. We ship healthy double-fan divisions or clumps (4-5 fans), unless other-wise indicated. Occasionally, low stock varieties and some new introductions will be shipped as single fans. Our guarantee still applies. 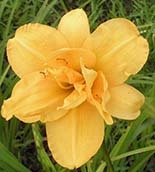 or here for printable file of our most popular daylilies and iris. 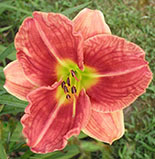 or if you would like to purchase daylilies online, click "Add to Cart" under the picture of the daylily. green throat. Extremely fragrant and reblooms. 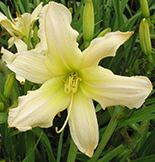 Large lavender-cream daylily with a green throat. Very fragrant and reblooms. with even brighter red halo and greenish throat. Poppy ochre red with amber rose edges and poppy ochre red eyezone above deep green throat. Large and very fragrant and extended blooming. Reblooms. 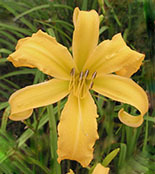 Absolutely unique, golden yellow with striking mahogany eye on the petals only. Glowing green throat is radiant. Large and very showy, fragrant and nocturnal. Small silvery, violet lavender with a darker eyezone. Tall, very fragrant and reblooms. throat. Wide petalled and fragrant and extended blooming. eyezone. Fragrant and extended blooming. Reblooms. ruffling for the late June garden. Fragrant. Very fragrant violet self with light midrib over a green throat. H.M. Award. and reblooms. Large and early blooming. 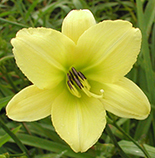 Very fragrant soft yellow flower with a green throat. Medium sized with wide, ruffled petals. J.C. Award. Small round, ruffled mauve-lavender flower with chalky lavender band and green throat. Fragrant and reblooms. J.C. and H.M. Awards. 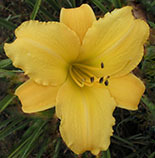 Exotic, russet yellow spider-like form with rolled petals and yellow-green throat. Nice low growing attention grabber. Fragrant and reblooms. 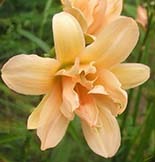 A strikingly beautiful flower in an unusual shade of light tangerine with yellow-green throat. Large and fragrant. J. C. Award. 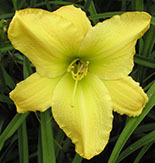 A gigantic and beautiful flower of chartreuse yellow which is creped and ruffled. Fragrant. A.M. and H.M. Awards. 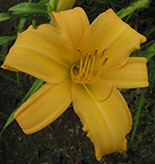 Extra late blooming, very tall, yellow with faint red overlay. Candelabra branching gives it a super bud count. 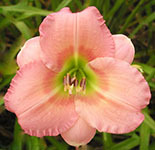 Fragrant altissima hybrid spider of medium size. Extended blooming. A welcome addition to the late garden. lemon yellow and mini-ribs are air-brushed white. Fragrant and reblooms. An award winning miniature. 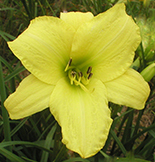 Tall, early blooming bright lemon-yellow daylily. green-yellow throat. Very fragrant. 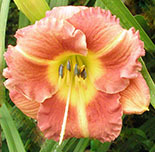 H.M. and A.M.
Showy burgundy eyezone sets off this large orange flower. Attracts immediate attention from a distance. Tall, fragrant and extended blooming. 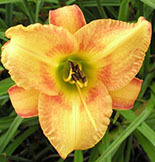 Large, showy wide-petalled yellow with striking peach overcast and contrasting pink midribs. Polychrome with excellent form and substance. This is what a polychrome blend should look like. Fragrant and extended blooming. Wide flat, deep lavender flower with showy green throat. Large and fragrant extended bloomer. J.C. and H.M. Awards. 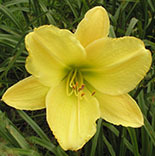 Small fragrant soft lemon yellow blooms with ruffled edges and a green yellow throat. Blooms early with extended blooming. Reblooms continually to frost. Maroon self with yellow-gold throat. Fragrant and nocturnal. 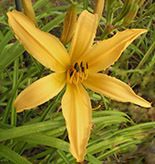 Bright yellow flower with prominent, wine eyezone. Tall and fragrant. 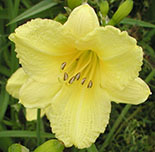 Very showy, bright lemon yellow with flat open form. Large and wide petalled. Fragrant, nocturnal and reblooms. 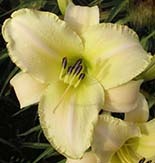 Stately, large, lemon yellow with lime throat Fragrant season extender. A real standout in the August garden. 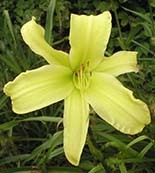 Large, yellow daylily with green throat for the August garden. Fragrant and nocturnal. Brilliant deep orange that is almost fluorescent. Very fragrant with heavy substance. Extended blooming. H.M. and A.M. Awards. 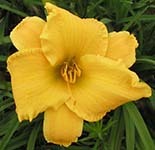 This time-tested butter yellow daylily is a real beauty, especially in a clump. 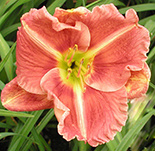 A consistent rebloomer with excellent bud count gives this nocturnal a long season. Tall and fragrant. 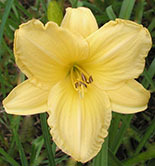 Fine pale-yellow miniature. Nocturnal bloomer with low neat compact foliage. Reblooms reliably. Fragrant. Yellow-green self with green throat. Low growing. substance. Tall with fine quality and fragrant. H.M.
Yellow with pink midribs. Fragrant and reblooms. throat. Fragrant and extended blooming. Reblooms. Enormous muted orangy yellow self with green throat. 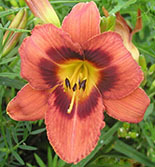 largest flowered daylilies we grow. Nocturnal and reblooms. deep yellow throat. Low growing. Fragrant and reblooms. beautiful August bloomer with extended blooming. A.M. 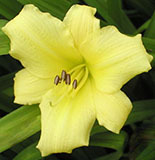 Beautifully ruffled, soft-yellow polychrome blend with an attractive rich green throat. Full flowers and nice branching. Fragrant. J.C. Award. Gold self with green throat. Fragrant and extended blooming. J.C. Award. Fragrant purple bitone with green throat. Quite a large flower. H.M. Award. early bloomer with extended blooming. Reblooms. clarity. Fragrant and reblooms. H.M. Award. 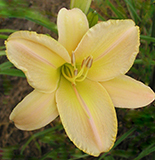 Lovely, clear, pink with deeper rose halo above yellow halo and dark green throat. Excellent form with wide, overlapping petals. Nicely ruffled, very fragrant and reblooms. Exceptionally good tasting for salad or desert. J.C. and A.M. Awards. 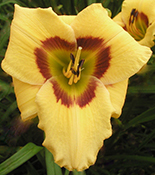 Bright butter-yellow flower with edges brushed with cinnamon red and faint cinnamon eyezone. Slightly fragrant. H.M. Award. 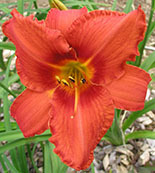 Large orange-red flower with red eyezone. Fragrant. Cream blend with green-yellow throat. Low growing. Fragrant late bloomer with extended blooming. H.M. Award. Large fragrant near white. An exceptional garden plant. Reblooms. Limited. Fragrant, greenish yellow self with green throat. Quite tall. This 2001 introduction is a beguiling blackish purple with a near-black eye and gold throat. The color changes through the day becoming burnished with red copper highlights above the black eyezone. Fragrant. 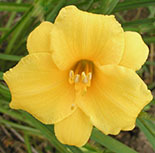 Fragrant, tall, very pale-yellow flower with different lavender brown halo. H.M. Award. Black lavender and lavender-pink bitone with cream-green throat. Fragrant and reblooms. Extended blooming. late June with extended blooming. Reblooms. Golden-yellow flower with chartreuse throat and frilled edges. Fragrant. blooms on tall stalks. Extended blooming. Medium sized chartreuse-yellow spider form. Low growing. Deep apricot blend with green throat. Fragrant extended bloomer. Reblooms. J.C. Award. 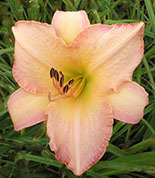 Very light pastel-pink flower with soft-yellow throat. Fragrant extended bloomer. Large brilliant orange with multiple branching. A show stopper for size and color in the August garden. Fragrant and reblooms. 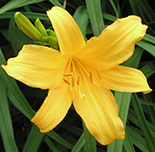 Very large, fragrant medium-yellow daylily that glows across the garden. Reblooms. 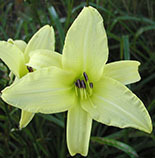 Large, attractive light-yellow flower with yellow-green throat. Light fragrance and well branched. Extended blooming. Reblooms lightly here. Stunning, cream-ivory flower with a lime-green throat. Wide petalled and fragrant. Reblooms lightly. petalled and fragrant extended bloomer. Reblooms lightly. One of the first “white’s” to bloom here. 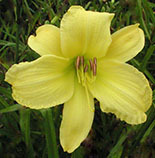 Pale yellow flower with green throat. Fragrant. 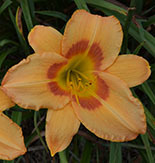 Bright, clear glowing-orange double daylily of moderate size. Pretty compact doubling form. Faint fragrance. 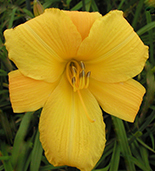 Very large and showy, glowing polychrome yellow with pink and melon tones suffused through it. Very green throat surrounded by intense-yellow zone. Fragrant and neatly ruffled. A superior flower due to its inner glow. Extended blooming. and pink. Low growing. Absolutely gorgeous. H.M. Award. 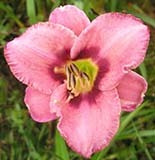 Very fragrant, medium pink flower with a greenish throat for the late June garden. Very fragrant, super quality pastel blend of yellow-green and pink. Low growing. Absolutely gorgeous. H.M. Award. Medium violet double with dark violet eyezone and green throat. Fragrant and extended blooming. Reblooms. doubling. "Fluffy" look and faint fragrance. Extended blooming. Fragrant, very full heavy substanced coral and tan bitone. Quite special in the August garden. throat. Fragrant. Blooms in late June. Creamy pink double flower with light lilac overcast. Fragrant. Very different color in doubles. Chartreuse-yellow flower with very tailored symmetrical doubling. Medium sized flower and a fine neat look. Fragrant extended bloomer. Dark, bright red double with chartreuse-green throat. Fragrant. 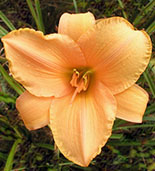 Large, glowing peach-apricot pastel blend with neatly ruffled margin and yellow-green throat. Very fine glistening color. Fragrant and nocturnal. color on underside of sepals. The red buds are distinctive. Very fragrant. Foliage is blue green and spikey. fragrant, low growing and extended blooming. Reblooms. 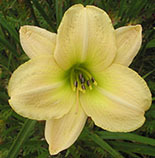 Large, cream-flesh flower with a chartreuse throat. Fragrant and reblooms. J.C. and H.M. Award. 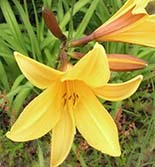 Fragrant, large gold self with green throat for the late June garden. Ruffled. 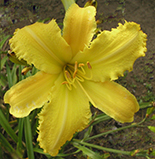 The first daylily to bloom here. Very fragrant golden yellow. 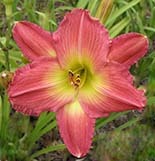 Charming tall and old fashioned daylily with extended bloom. 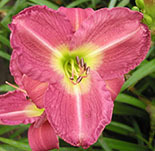 Large and fragrant, bright pink daylily with deep green throat. Blooms in late June and reblooms. garden. Very fragrant and reblooms. Huge light pink blend with extra heavy substance. Fragrant. olive-green throat. Very fragrant and reblooms. Heavily ruffled and crinkled buff yellow with light burgundy eyezone. Stunning, flat opening flower with very wide petals. Nocturnal, fragrant and reblooms. J.C. and H.M. Awards. Bright red flower with a green throat. Fragrant. 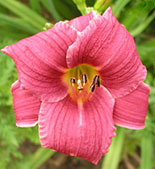 Large dusty-pink flower with gold throat. Very fragrant extended bloomer. Low growing. Blooms in late June and reblooms. Very fragrant, extremely large, rose-cardinal red self above dark green throat. Reblooms. reblooms. Low growing. H.M. Award. Beautifully formed very fragrant bright yellow flower. Very early bloom time, one of the first to bloom here. Very fragrant, Lapis-purple-gray bitone above green throat. Child of Stella de Oro that is even more floriferous, if that can be pictured. Fragrant yellow nocturnal rebloomer. Perfect in pots or the front of the border. green throat. Good bud count gives this a long bloom season. 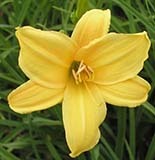 Very fragrant light yellow daylily. Large flower. reblooms lightly here. J. C. Award. above a pale yellow to green throat. Fragrant and reblooms. 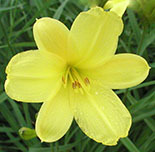 Late blooming and fragrant, lemon yellow with wide petals. 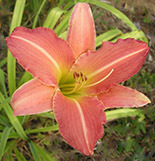 Tall daylily in the August garden. throat. Large flower, fragrant and reblooms. and a cream throat. Fragrant and reblooms. 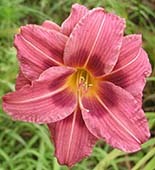 Large, dramatic, fuchsia-purple daylily with a cream throat. Fragrant and extended blooming. Reblooms. Fine multiflora lemon-yellow flower with white midribs and excellent branching. Fragrant and extended blooming. Reblooms. Neatly formed, peach-pink, overlapping petals accented by a radiant apricot throat. Fine pleated, ruffling and excellent branching with up to 28 buds per scape. Robust performer. Glows in the late August garden. Fragrant. with long bloom season. Extended blooming. Reblooms. and green throat. Blooms in late June and reblooms. 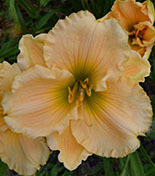 Eye-catching, well formed, heavily ruffled, soft light golden yellow. Super for form and color clarity. Fragrant and extended blooming. Reblooms. 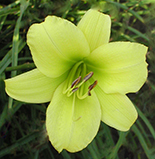 Extra large, greenish-yellow flower with green throat. Beautiful round and ruffled form with overlapping flat opening petals. Unique minty fragrance. Extended blooming. Large chartreuse blend with seaweed-green throat. Fragrant and extended blooming. throat extending into the petals and sepals giving an interesting halo watermark pattern. Fragrant. Lovely color and form, makes this a garden standout. Small flowered, multiflora greenish-yellow flower with green throat. 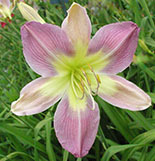 It has an extraordinarily long bloom season due to its high bud count and light rebloom. Fragrant and extended blooming. One of our favorites. 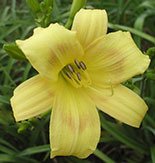 Nice pale-yellow daylily that blooms early in the season and continues to rebloom until frost. Fragrant extended bloomer. 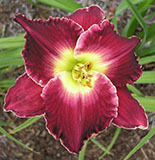 Early blooming, dark purple daylily with black eyezone. Fragrant, nocturnal and extended blooming. Fragrant yellow flower with striking purple eyezone. 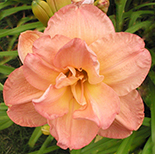 Very large, ruffled apricot with a bright gold overlay. A showpiece. Fragrant with an extended bloom season. H.M. Award. greenish-yellow throat. Fragrant extended bloomer. Reblooms. and extended blooming. Blooms in June and reblooms. throat. Low growing. Very fragrant extended bloomer. Fragrant, apricot-cream blend with green throat. Blooms in the late season and reblooms. 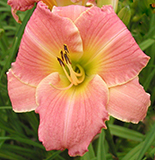 Lavender-pink daylily with rose halo and green throat. Large, fragrant and extended blooming. 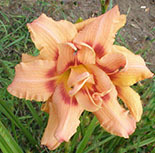 Click here for a printable file of our most popular daylilies and iris.